General View of upright cross slab at Nigg. 7'3'' high by 3'5'' wide, and 5'' thick. 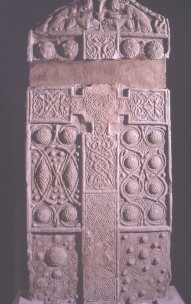 This shows the front of the upright cross slab at Nigg, which is sculptured on three faces. There is a pediment at the top of this slab. In the middle of the rectangular part there is a cross. In the pediment there are two bearded ecclesiastics, with books in their hands, possible in an attitude of adoration, with an object resembling a chalice in the middle between them, and a bird descending with a circular object in its beak. On each side of the central object, and in front of both ecclesiastics, there is a beast in a crouching position with its tail between its legs. A tree of three stems plaited together springs from both lower corners of the pediment and cntinues up the sloping sides to the point at the top, where the stems terminate in buds and leaves. In the centre of the cross there is interlaced work. On the top arm of the cross three pairs of beasts interlace, but the lower portion is broken away. On the left arm of the cross there are three pairs of beasts interlaced. On the right arm of the cross there are four pairs of beasts interlaced. On the bottom arm of the cross there are four pairs of beasts interlaced. On the middle of the cross shaft there is a diagonal key pattern. On the bottom of the shaft there is a piece of interlaced work (hidden by the base). The background of the cross is ornamented with bosses and behind these a key-pattern. There are six panels on the background.